We have none other than William Shakespeare, in a sense, to thank for the prodigious and polarizing presence of the European Starling in North America. In the 1890s, the American Acclimatization Society released 100-odd starlings in Central Park as part of its rather esoteric – and certainly misguided – campaign to install on the continent all the birds mentioned in the Bard’s works. Needless to say, when it came to the European Starling, the Society’s efforts were a raging success: Better than 200 million screech, whistle, and flutter from Alaska to Mexico, and coast to coast. The starling’s invasion of North America has spelled problems for native birds, not least those that compete with the Shakespearean newcomer for nesting cavities, such as bluebirds, Purple Martins, and Wood Ducks. More than a few conservationists and birdwatchers – not to mention farmers and everyday homeowners – curse the starling for its feathered hordes and heavy-handed occupation of ecosystems. But of course the starling isn’t to blame for its New World expansion – humans are – and even while acknowledging its real ecological impacts we can appreciate the beauty of the glossy and rich-voiced creature. That includes the undeniably majestic spectacle, now such a familiar sight in the U.S. and Canada, of a hundreds- or thousands-strong starling flock on the wing, pulsing and wheeling as one. Starlings exhibit two basic appearances throughout the year related to the so-called “wear molt” by which they replace their feathers. New feathers grown in fall come white-tipped, giving the winter starling a white-spotted appearance; by spring, the spots have worn away and the starling appears uniformly dark with a purple-green gloss: quite a lovely look. The bright yellow bill and orange legs contrast sharply with the blackish body. European Starlings commonly forage in mixed flocks with blackbirds and grackles (as well as occasionally with American Robins, pigeons, and sparrows), but as long as you can get a decent bead on them they should stand out from the pack with their bright bills, dark eyes, stub tails, and wintertime speckles. In flight, it’s conceivably possible to mistake a starling for, say, a similarly chunky meadowlark, but anything more than a brief glimpse should clear up any confusion. Part of the starling’s success in modern North America is due to its affinity for the landscapes of humanity: Cities, towns, suburbs, and farmland are where the species here most flourishes. In less developed countryside, starlings may frequent oldfields and other disturbed, successional habitats, but you’re unlikely to come across them in deep wilderness or heavy, mature forest. Another factor helping to explain the European Starling’s vast adopted dominion is the bird’s omnivorous diet: It’ll take advantage of a range of food sources. When insects, spiders, millipedes, and other arthropods are available, starlings prefer this invertebrate fare. In fall and winter, fruits and seeds become more important. Starlings will also forage for nectar amid spring and summer blooms, and certainly happily visit feeders. When rustling up invertebrates or seeds, European Starlings scurry across the ground, sifting through grass and probing the soil with their busy beaks. They tend to forage in flocks – again, not uncommonly counting blackbirds and other species in their ranks. European Starlings are gifted songsters, well known for their ability to mimic the calls of everything from meadowlarks to Red-tailed Hawks. (Starlings are relatives of even more celebrated mimics: the mynahs.) A typical starling song is a rolling, liquid gurgle interspersed with whistles and trills, renditions of other birds woven into the mix. Both males and females sing. When calling to one another, starlings squawk, shriek, chatter, and buzz in a similarly rich communication repertoire. The buzzing, fluid songs and calls of starlings in one of their mass flocks can create an impressive cacophony indeed. You can listen to examples of the European Starling call song here. Males stake out nesting territories where they lure in females with their songs, often accompanied by fluttering wings. European Starlings fiercely defend these territories: not only from other starlings, but also other cavity-nesting birds. Nest sites tend to be in the tree holes made by woodpeckers or tucked amid the nooks and crannies of buildings and other manmade infrastructure, as well as occasionally in cliff crevices and riverbank burrows. The male starling usually kicks off nest construction, while the female attends to the finishing touches. Twigs, leaves, grass, trash, and other material compose the scaffold, within which the birds create a hollow outfitted with a soft, plush lining for the eggs themselves. European Starlings typically lay on the order of four to six eggs in these cavity nests. Both male and female starling helps incubate the eggs for 12 days or so, and both feed the hatchlings until they fledge after a bit more than 20 days or so. As the Cornell Lab of Ornithology notes, some female starlings that don’t manage to successfully mate until late in the year sometimes parasitically lay their eggs in the nests of other starlings. Cornell Lab of Ornithology. All About Birds: European Starling. Kaufman, Ken. 2000. Birds of North America. Houghton Mifflin Company. National Audubon Society. 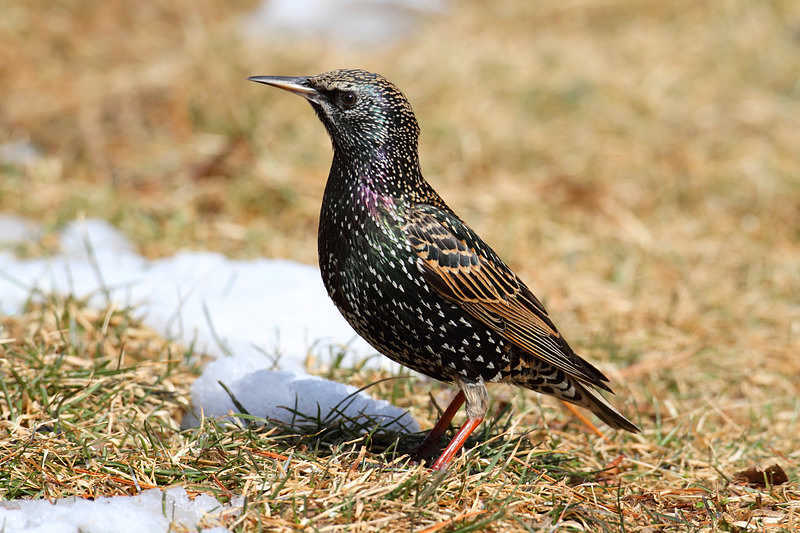 Guide to North American Birds: European Starling. Sibley, David Allen. 2000. The Sibley Guide to Birds. Alfred A. Knopf. Hey Buddy!, I found this information for you: "The European Starling". Here is the website link: http://backyardbirdingblog.com/european-starling/. Thank you.